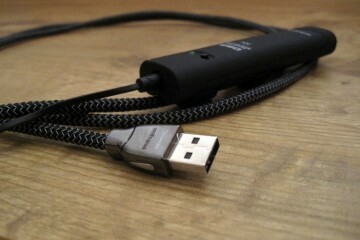 Now here’s a USB cable that positively deviates from the norm, in both appearance and sonic attributes. 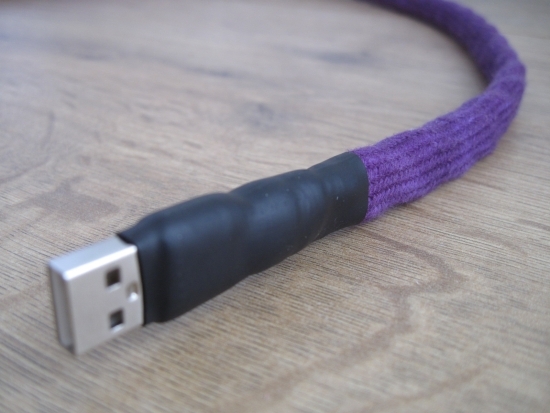 Who said that all USB cables sound alike? The very notion that USB cables could have an influence on sound is difficult to come to grips with. I understand that all too well. Some years ago I didn’t think there would be much difference myself, if any. After all, if you look into how USB works, there shouldn’t be any difference. With SPDIF cables many people were also sceptic. But at least with that standard by now we know that jitter is a major factor. For USB, jitter shouldn’t matter. But guess what? Apparently it still does! Sceptics can stop reading now because beyond this point it will only get worse. No worries: I understand the sceptic’s viewing point but my methods of assessment are based on audibility alone. If one cable sounds different from another, then so be it. 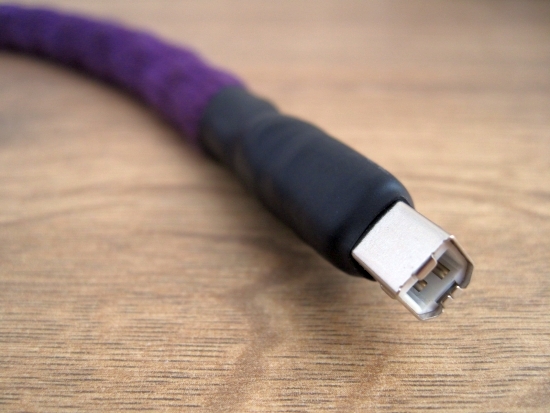 Elijah Audio is a young Australian company that specialises in USB cables. They have rightfully identified the benefits of disconnecting the 5v powerconductor and applying battery power operation. I have written about battery power operation using the KingRex UArt USB Y cable and although it seems unbelievable, it made a lot of difference. There are things to say for and against battery power operation but there’s no denying that there are differences. For this reason, Elijah Audio have a range of cables that facilitate just this. 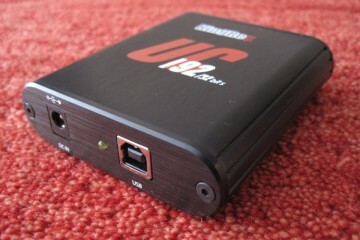 But Elijah Audio do more than address the benefits of clean USB transmission. Their cables are not based on standard available USB cables but are 100% hand made and based around Twisted Pair Audience OCC Cryo Copper in tight cotton tubing. 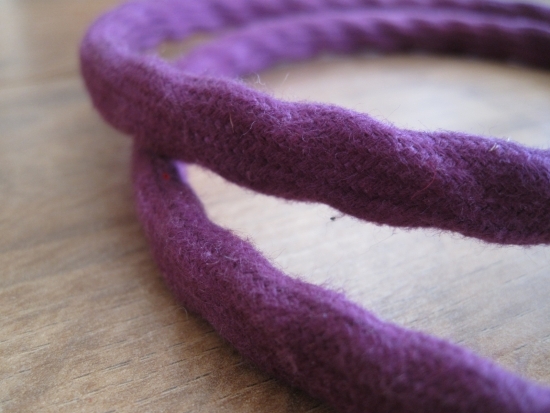 The two pairs are again covered in pure hand-dyed cotton sleeving. The gold contact pins have been treated with Caig’s Pro Gold contact enhancer. Incidentally, the cable under review here, is the only model Elijah Audio offer, that does have the 5v pin connected. All the above would be meaningless if the sound didn’t benefit. But benefit it does, and how! It’s nice how sometimes the look and feel of a product translate into an analogy in sound characteristics. Precisely that is the case here: the Quad Braid is the most fluid, free-flowing and supple sounding USB cable I have heard to date. 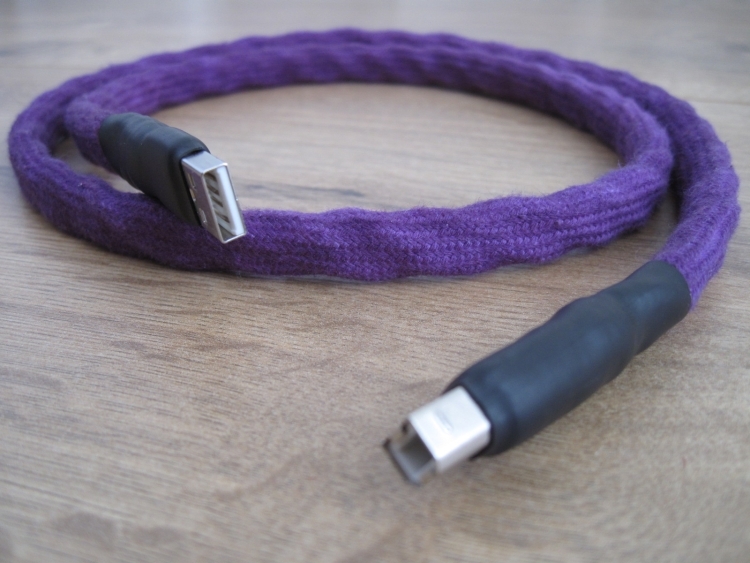 Standard USB cables are usually fine until you start comparing. And even if you do, you’ll probably conclude that these standard cables seem to let all the signal through while not masking detail. 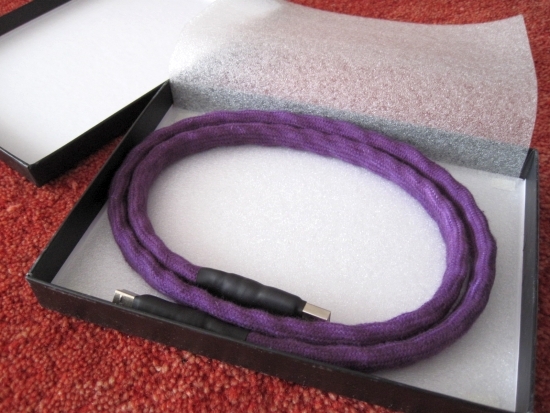 But what usually lacks compared to better cables is colour and substance. 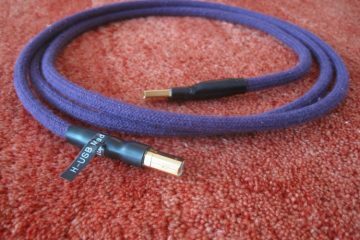 In my experience, high end USB cables can provide either higher resolution and low level detail (Audioquest Diamond USB) or a warmer, fuller, more solid and acoustical sound (KingRex UArt). The Quad Braid provides a third alternative, which is, dare I say it, a more analog sound. Oh dear. I’ve done it. I’ve proclaimed a digital cable to sound analog. How is that even possible? Well, I don’t know. But I do know that it is so. 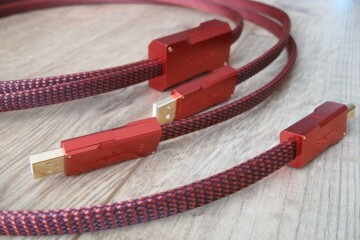 Connected between the AudioAanZee Ultra Flow music server and the Rowland Aeris DAC, the Elijah Audio Quad Braid provides the most analog sound that I have heard from a digital source yet. Don’t think that it must be a thick and congested sounding cable though. If this was the case then I certainly wouldn’t have liked it. Let me try to describe its sonic attributes more precisely by comparing to the KingRex UArt USB cable and a standard cable. The KingRex UArt USB cable was my favorite cable until I heard the Quad Braid. The KingRex is a solid improvement over standard USB cables: much fuller bass, more colour, better soundstaging and a more acoustical, more believable sound. If the standard USB cable were an ok middle-class CD player, the Kingrex would be more like a Wadia 861 CD player. The differences really are that big. But the Wadia comparison goes further than you might first suspect, covering both the better and lesser areas of the brand, its lesser areas being a dryness in the treble and a lack of upper air. To compensate for this, Wadias invariably offer outstanding bass performance, solidity and soundstaging. The KingRex is no different. Or if you’d like to talk DAC’s instead of CD players: the Kingrex is much like a PS Audio PWD MKII. Please bear with me as I take this silly comparison a little further. If the KingRex would be likened to a Wadia 861 or PS Audio PWD MKII, the Quad Braid would be a Meridian 808.3 or a CD player of choice with a Philips Swing-Arm CD transport, or, to put it more clearly, the belt-driven CEC TL1x CD transport. For those who don’t know that transport: it is the most analog sounding transport that I have heard. Like the TL1x and the best of the Philips CDM’s, the Quad Braid manages to sound gentler, smoother, more fluid and more airy than other USB cables, without tipping over into thickening or a lifeless sound. Sure, just like a Wadia CD player will always be preferred over other CD players by those that love them, the Quad Braid may not be everyone’s friend. 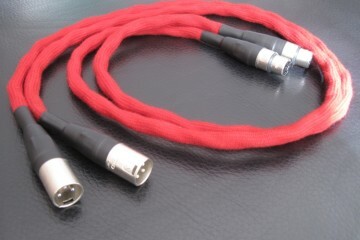 The KingRex cable does have more powerful bass and is more articulate in the lower registers. You could call it more dynamic. The Audioquest Diamond USB sounds more forward and articulate and you could call it more precise. But I find precision and dynamics in themselves to be of less importance than the musical whole. Besides, the Quad Braid has very lifelike dynamics that swing from micro to macro in an unexaggerated, natural fashion and all the low level resolution that you might wish for. Just less etched than with other cables. More analog. Whoops, I said it again. But I can’t really make it any clearer than that. Well, there’s one more comparison I could make to further make my point. The Quad Braid’s portrayal of music is much like the typical Jeff Rowland sound: dynamic yet gentle, smooth yet agile, colourful yet neutral. Above: The colour is a little difficult to photograph as it tends to shift depending on ambient light conditions. 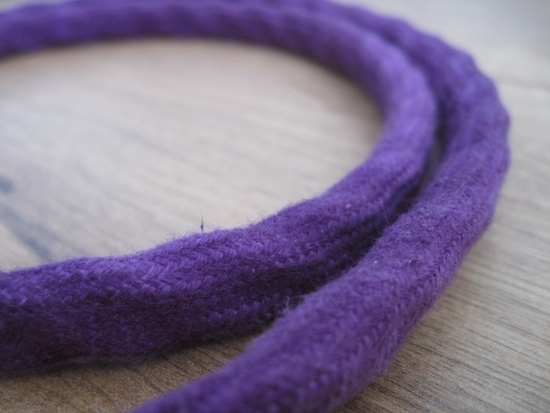 The colour of this sample is called purple and in reality it holds the middle between the two pictures above. The cable is also available in bright orange. In the prefix I already mentioned that the KingRex UArt used to be my favorite USB cable. It might come as no surprise then that the Quad Braid is my new reference. There are cables that sound more forward, more solid or more precise but none that I have heard to date managed to combine these various aspects into such a coherent whole as the Quad Braid does. This cable simply excells where it matters most: to convey pure emotion while avoiding any digital artefacts. Oh, did I mention that it doesn’t cost an arm and a leg? 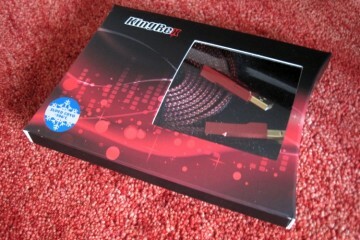 At less than 180 euro and with a 60-day satisfaction guarantee, this is a must-hear cable! Hi , my name is Ruben and I’m a pro jazz pianist. I have a simple but very musical fi-fi setup but I need to do some changes to improve my listening experience. 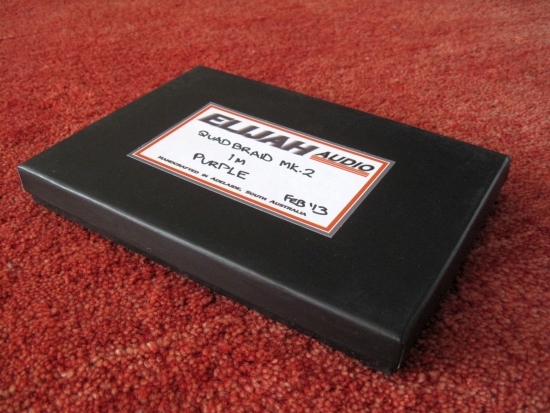 I’m trying to buy an Elijah Audio Quad Braid MkII USB cable (computer to DAC) but it looks that is not available anymore ?¡¡ I’ve been looking at their web site but didn’t found it. Can somebody PLEASE recommend me another option or if is there a new model from Elijah with the EXACTLY (or even better) characteristics in sound etc? 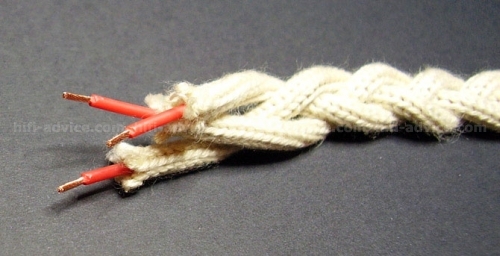 Hi Ruben, the Quad Braid MKII has been succeeded by improved models and is currently on the MK4 version. The basic ingredients have not changed and I would wager that the sound would still be very similar. I have checked with Michael from Elihah Audio and he confirms that the MKII can still be manufactured. 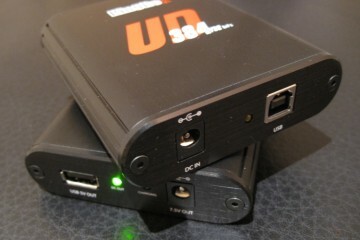 The reason for the later versions is to further increase stability and compatibility. Judging from my experience going from the initial Quad Braid to the MKII chances are that the basic sound ingredients are still in place but with enhanced control. Perhaps that’s not what you are after and in that case I would suggest asking Michael to manufacture a MKII for you. Later Wireworld Gold Starlight cables do indeed deviate from the III+ version that I like so much for its round and smooth sound. These things I’m afraid are inevitable, as manufacturers continuously strive to upgrade their products. Luckily there is still the second hand market. Hi Christiaan ¡ THANKS for your help. As you can see, i’m trying to update the best I can my hi-fi system. Mainly the music I listen to is Jazz (from Blue note recordings to ECM pristine sound) & a lot of classic (from solo piano recordings, string quartets, big orchestras works etc). I just found out that the Wilson’s are very common used with Transparent. The only thing I need to figure it out, is which power cable I’ll choose for the Studer CD and for the Mosaic DAC. If you have some comment about anything or any detail regarding this setup I will appreciated If you let me know. Hi Ruben, while my preferences need not match yours, here’s what I would advise from my perspective. First you should know that EC Designs are working on a new DAC with USB connection and I am unsure if the Mosaic is still available. I have no further info on this so please check with the manufacturers. Transparent is indeed an obvious choice for Wilson and also a brand that I happen to like very much. However, although you did not state your amp, in general I cannot recommend the plus (nor the Super), rather I would advise to go for the Ultra. Power cable for the Studer depends on the direction that you want to steer its sound. For the Mosaic DAC you’ll need to find a powercable with a figure of 8 connector and this DAC is happiest with lively sounding cables.